Booker T & the MG's - Uptight! This soundtrack album to Jules Dassin's film of the same name proved a successful endeavor for Booker T. and the MG's; the music here was as adventurous and diverse as anything they'd done. For starters, it required the band to focus more on their already exceptional "ambient" elements, stretching out in slower, spacier grooves than their studio albums (or record-buying audience) would allow. Step by Step - I always wanted to be in the Band! Quite possibly the greatest soul band ever to come out of Milwaukee – and a tight little ensemble who've got a really great sound! The overall feel of their work is a bit hard to peg – as the group are equally great at mellow midtempo group numbers as they are at tighter, clubbier tunes that snap with a bit more of a horn-heavy sound – and throughout the record there's a really playful feel that shows that whatever the sound, whatever the setting, these guys just had a heck of a great time working with each other! 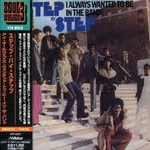 That quality can be heard especially well on the title track "I Always Wanted To Be In The Band" – a great little number that's almost an updating of the TSU Tornadoes sound for the 70s – but the whole set's great, and other tracks move into some great super-dope production that we really love! Titles include "I Am A Lonely Man", "People", "Cool Days Are Out Of Style", "I Ain't Never Gonna Let You Go", and "Cash Money".